The 2018 Atlantic hurricane season was the third in a consecutive series of above-average and damaging Atlantic hurricane seasons, featuring 15 named storms, 8 hurricanes, and 2 major hurricanes, which caused a total of over $49.975 billion (2018 USD) in damages. The season officially began on June 1, 2018, and ended on November 30, 2018. These dates historically describe the period each year when most tropical cyclones form in the Atlantic basin and are adopted by convention. The formation of Tropical Storm Alberto on May 25, marked the fourth consecutive year in which a storm developed before the official start of the season. 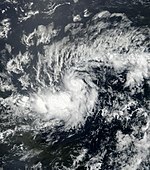 The next storm, Beryl, became the first hurricane to form in the eastern Atlantic during the month of July since Bertha in 2008. Chris, upgraded to a hurricane on July 10, became the earliest second hurricane in a season since 2005. No hurricanes formed in the North Atlantic during the month of August, marking the first season since 2013, and the eighth season on record, to do so. On September 5, Florence became the first major hurricane of the season. On September 12, Joyce formed, making 2018 the first season since 2008 to feature four named storms active simultaneously (Florence, Helene, Isaac, and Joyce). On October 9, Michael became the second major hurricane of the season, and a day later, it became the third-most intense hurricane to make landfall on the United States in terms of pressure, behind the 1935 Labor Day hurricane and Hurricane Camille of 1969. With the formation of Oscar on October 26, the season is the first on record to see seven storms that were subtropical at some point in their lifetimes (Alberto, Beryl, Debby, Ernesto, Joyce, Leslie, and Oscar). Most forecasting groups called for a below-average season due to cooler than normal sea surface temperatures in the tropical Atlantic and the anticipated development of an El Niño. However, the anticipated El Niño failed to develop in time to suppress activity, and activity exceeded most predictions. The first forecast for the year was released by TSR on December 7, 2017, which predicted a slightly above-average season for 2018, with a total of 15 named storms, 7 hurricanes, and 3 major hurricanes. On April 5, 2018, CSU released its forecast, predicting a slightly above-average season with 14 named storms, 7 hurricanes, and 3 major hurricanes. TSR released its second forecast on the same day, predicting a slightly-below average hurricane season, with 12 named storms, 6 hurricanes, and 2 major hurricanes, the reduction in both the number and size of storms compared to its first forecast being due to recent anomalous cooling in the far northern and tropical Atlantic. Several days later, on April 16, North Carolina State University released its predictions, forecasting an above-average season, with 14–18 named storms, 7–11 hurricanes, and 3–5 major hurricanes. On April 19, The Weather Company released its first forecasts, predicting 2018 to be a near-average season, with a total of 13 named storms, 7 hurricanes, and 2 major hurricanes. On May 24, NOAA released their first forecasts, calling for a near to above average season in 2018. On May 25, the UK Met Office released their prediction, predicting 11 tropical storms, 6 hurricanes, and an Accumulated Cyclone Energy (ACE) value of approximately 105 units. In contrast, on May 30, TSR released their updated prediction, significantly reducing their numbers to 9 named storms, 4 hurricanes and 1 major hurricane, citing a sea surface temperature setup analogous of those observed during the cool phase of the Atlantic multidecadal oscillation. On May 31, one day before the season officially began, CSU updated their forecast to include Tropical Storm Alberto, also decreasing their numbers due to anomalous cooling in the tropical and far northern Atlantic. On July 2, CSU updated their forecast once more, lowering their numbers again to 11 named storms, 4 hurricanes, and 1 major hurricane, citing the continued cooling in the Atlantic and an increasing chance of El Niño forming later in the year. TSR released their fourth forecast on July 5, retaining the same numbers as their previous forecast. On August 2, CSU updated their forecast again, increasing their numbers to 12 named storms, 5 hurricanes, and 1 major hurricane, citing the increasing chance of a weak El Niño forming later in the year. Four days later, TSR issued their final forecast for the season, slightly increasing their numbers to 11 named storms, 5 hurricanes and only one major hurricane, with the reason of having two unexpected hurricanes forming by the beginning of July. On August 9, 2018, NOAA revised its predictions, forecasting a below-average season with 9–13 named storms, 4–7 hurricanes, and 0–2 major hurricanes for all of the 2018 season. The 2018 Atlantic hurricane season became the most recent season to feature four simultaneous named storms, after 2008. Visible in the image is Florence (left), Isaac (bottom center), Helene (lower right), and Joyce (upper right) on September 12. For the fourth consecutive year, activity began early, with the formation of Tropical Storm Alberto on May 25. Alberto went on to attain winds of 65 mph, before making landfall in North Florida with winds of 45 mph. Alberto reached the Great Lakes region as a tropical depression, before dissipating over Lake Michigan on May 31. After a month of inactivity, Beryl formed in the Main Development Region on July 5, attaining hurricane status before dissipating just east of the Caribbean. Beryl redeveloped on July 14 in the Atlantic, before dissipating on July 16. 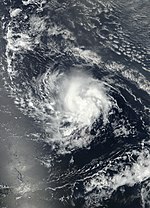 Chris formed a day after Beryl, strengthening to a Category 2 hurricane on July 11, before dissipating over Atlantic Canada on the following day. August featured little activity in the form of Debby and Ernesto, neither of which became a hurricane or affected land. However, Ernesto was the fourth storm of the season that was a subtropical cyclone at some point in its life. The next tropical cyclone, Hurricane Florence, formed on August 31, and became the first major hurricane of the season on September 5, just one day later than the average of September 4. Florence made landfall in North Carolina on September 14, becoming the wettest tropical cyclone on record there and in neighboring South Carolina. Activity would increase dramatically in September with Tropical Storm Gordon forming on September 3, which would go on to cause minor damage and two deaths after making landfall in Mississippi. Hurricanes Helene and Isaac followed suit on September 7, making 2018 the second consecutive year with three hurricanes simultaneously active. 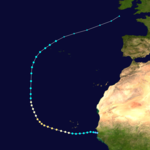 Helene killed three people in West Africa, and caused minor damage in the UK as an extratropical cyclone, while Isaac caused negligible damage in the Caribbean. Florence, Helene, Isaac, and Joyce, which formed on September 13, marked the first time four storms were active simultaneously in the Atlantic since 2008. After a brief period of inactivity, Kirk and a tropical depression formed on September 22, and Subtropical Storm Leslie followed suit the following day, marking the first time on record six storms (Alberto, Beryl, Debby, Ernesto, Joyce and Leslie) were designated a subtropical storm. Activity picked up once again in October, with Michael forming on October 7 and strengthening into a major hurricane over the Gulf of Mexico, before making landfall in the Florida Panhandle at peak intensity, on October 10. 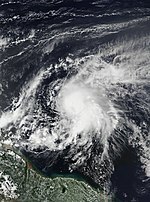 On October 9, Tropical Storm Nadine developed in the eastern tropical Atlantic. After fifteen days as a tropical cyclone, on October 13, Leslie transitioned into a powerful extratropical cyclone approximately 120 miles west of the Iberian Peninsula, before making landfall soon afterward. A two-week period of inactivity ensued as the season began to wind down. On October 27, Oscar, the seventh in a record-breaking number of subtropical storms developed in the central Atlantic Ocean. Oscar intensified into a hurricane the next day, making it the eighth hurricane of the season. Oscar's dissipation ended the season on October 31, a month prior to the season's official end. No systems formed in November, making it the first occurrence since 2014. A broad area of low pressure formed over the southwestern Caribbean Sea on May 21, as the result of the interaction between an upper-level low and a weak surface trough. The low drifted slowly westward and then northward through the Caribbean Sea as it gradually organized. By 15:00 UTC on May 25, the strongly sheared low had organized sufficiently to be classified as Subtropical Storm Alberto while situated about 55 miles (90 km) south of Cozumel, Quintana Roo, which made this season the fourth-consecutive season in which storms formed earlier than the official start of the season on June 1. After remaining nearly stationary for the next day, Alberto began to move northwards. After entering the Gulf of Mexico, where wind shear lessened and sea surface temperatures were above average, Alberto began to intensify. Early on May 28, Alberto fully transitioned into a tropical storm and reached its peak intensity, with maximum sustained winds of 65 mph (100 km/h). Afterward, due to dry air interaction, Alberto began to weaken as it neared the Gulf Coast, making landfall near Laguna Beach, Florida, at 21:00 UTC with winds of 45 mph (75 km/h). The cyclone weakened to a tropical depression shortly after landfall. On May 31, Alberto finally transitioned to a post-tropical cyclone while over northern Michigan. The remnant low was subsequently absorbed by a frontal system over Ontario on the next day. Late on July 3, the NHC began tracking a vigorous tropical wave over the eastern tropical Atlantic for tropical cyclone development. 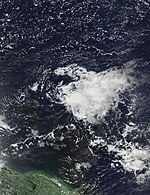 The tropical wave quickly coalesced as it moved westward, and at 15:00 UTC on July 5, it organized into a tropical depression while situated over the central tropical Atlantic Ocean. Favorable environmental conditions allowed the tiny system to strengthen, becoming Tropical Storm Beryl by 18:30 UTC, and further intensifying into a Category 1 hurricane by 06:00 UTC on July 6 as a pinhole eye became evident. Upon designation as a hurricane, it became the second earliest on record in the Main Development Region (south of 20°N and between 60° and 20°W), surpassed only by 1933's Hurricane Two. This intensity was short-lived, as accelerating low-level flow imparted shear on the cyclone and caused it to weaken back to tropical storm strength, by 15:00 UTC on July 7. An Air Force reconnaissance aircraft investigated the system early the next morning, finding that Beryl had degenerated into an open trough; the NHC de-classified Beryl as a tropical cyclone at 21:00 UTC on July 8, accordingly. The remnants were monitored for several days, although little organization occurred during much of that time. However, conditions gradually became more favorable for redevelopment, and on July 14 at 17:00 UTC, Beryl regenerated into a subtropical storm near Bermuda. The rejuvenated storm soon began to lose convection, as dry air infiltrated the system. By 03:00 UTC on July 16, Beryl degenerated into a remnant low once again, after having lacked organized convection for more than twelve hours. Late on July 2, the NHC began monitoring the potential for an area of low pressure to form near Bermuda. A non-tropical low formed a few hundred miles south of Bermuda on July 3. Shower and thunderstorm activity gradually became better defined as the low moved generally northwestward into the Gulf Stream. 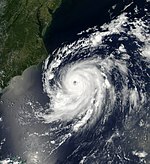 At 12:00 UTC on July 6, the low organized into Tropical Depression Three, while located off the coast of North Carolina. Strengthening of the depression was slow due to the circulation being elongated, and was further hampered by adjacent dry air. 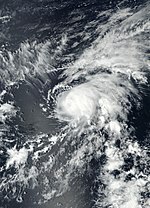 Nevertheless, at 06:00 UTC on July 8, Tropical Depression Three was upgraded into Tropical Storm Chris. Pulled slowly southeastwards by a passing cold front, Chris strengthened little throughout the day due to upwelling caused by its slow motion. However, on July 10, a developing trough over the northeastern United States accelerated Chris eastwards into warmer waters, allowing for the formation of an inner core. With a well-defined eye and impressive appearance on satellite imagery, Chris finally strengthened into a hurricane at 12:00 UTC that day. Chris proceeded to rapidly intensify to Category 2 hurricane status, as a convective ring in its core transformed into a full eyewall. However, the hurricane soon crossed the Gulf Stream into cooler waters, which, combined with the effects of a nearby mid-latitude trough, caused Chris to begin to undergo extratropical transition. At 12:00 UTC on July 12, Chris fully transitioned to an extratropical cyclone well southeast of Newfoundland. The low continued northeastwards over the North Atlantic for the next few days, before weakening and finally dissipating south of Iceland on July 17. While offshore, Hurricane Chris brought large swells to the East Coast of the United States, sparking hundreds of water rescues especially along the coasts of North Carolina, New Jersey, and Maryland. On July 7, a man drowned in rough seas attributed to the storm at Kill Devil Hills, North Carolina. A vacation home in Rodanthe, North Carolina was declared uninhabitable after swells generated by Chris eroded away the base of the building. As an extratropical cyclone, the system brought locally heavy rain and gusty winds to Newfoundland and Labrador. Rainfall accumulations peaked at 3.0 in (76 mm) in Gander, while gusts reached 60 mph (96 km/h) in Ferryland. Rainfall accumulations were highest on Sable Island, at 4.39 in (111.6 mm). On August 4, the NHC began monitoring a non-tropical low over the northern Atlantic Ocean for tropical or subtropical development. Initially, convection remained very limited, with the system consisting mostly of a convectionless swirl interacting with an upper-level low. However, as the system moved into a more favorable environment it gradually began to acquire subtropical characteristics. A large band of convection with tropical storm-force winds developed far from the center of the strengthening circulation, leading to the formation of Subtropical Storm Debby at 06:00 UTC on August 7. Moving northward along the western side of a mid-level ridge, deep convection increased near the center of the cyclone, and Debby transitioned to a tropical storm at 00:00 UTC on August 8. Throughout the day, despite moving over marginal sea surface temperatures, Debby strengthened while turning north-northeastward to northeastward. 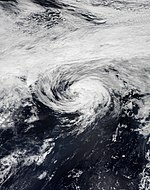 The tropical storm reached its peak intensity at 00:00 UTC on August 9 with maximum sustained winds of 50 mph (85 km/h) while a few hundred miles southeast of Cape Race, Newfoundland. Although Debby's passage over a warm Gulf Stream eddy allowed it to maintain its intensity for a short time, the entrainment of dry air into its circulation and passage over cooler waters caused its deep convection to dissipate. The cyclone degenerated into a remnant low at 18:00 UTC on August 9 and transitioned to an extratropical cyclone early on August 10 before becoming absorbed by a larger extratropical cyclone later that day. On August 28, the NHC first mentioned the possibility of tropical cyclone formation from a tropical wave expected to exit western Africa. Two days later, the tropical wave moved off the coast of Senegal, with disorganized thunderstorms and a well-defined low-pressure area. Due to the system's threat to the Cape Verde islands, the NHC initiated advisories on Potential Tropical Cyclone Six at 15:00 UTC on August 30. The system organized into Tropical Depression Six at 21:00 UTC on August 31. Early on September 1, Tropical Depression Six strengthened into Tropical Storm Florence. Gradual intensification occurred as Florence continued west-northwestward across the central Atlantic, and at 15:00 UTC on September 4, it intensified into the third hurricane of the season. On September 5, Florence unexpectedly underwent rapid intensification into a Category 3 major hurricane. Rapid intensification continued and at 21:00 UTC, Florence intensified into a Category 4 hurricane at 22°24′N 46°12′W﻿ / ﻿22.4°N 46.2°W﻿ / 22.4; -46.2﻿ (Florence), farther northeast than any previous Category 4 hurricane in the Atlantic during the satellite era. However, rapid intensification caused the now-stronger storm to veer northwards into a zone of greater vertical wind shear. Over the next 30 hours, Florence rapidly weakened into a tropical storm due to the strong wind shear, with the storm's cloud pattern becoming distorted. After entering a zone of less shear and crossing into warmer waters, Florence restrengthened into a hurricane on September 9. On the next day, Florence underwent a second period of rapid intensification and reintensified into a major hurricane. At 16:00 UTC on the same day, Florence reintensified into a Category 4 hurricane. Before impacting the coast however, Florence underwent an eyewall replacement cycle and encountered moderate wind shear, weakening it to a Category 2 hurricane. Florence quickly weakened into a tropical depression inland, and the NHC issued its last advisory at 10:00 UTC on September 16, passing on responsibility to the Weather Prediction Center (WPC). At that point, Florence had also begun to gradually accelerate westward. On September 17, Florence slowly turned to the northeast, while continuing to weaken. Late on the same day, Florence weakened into a remnant low, while situated over West Virginia. Florence still posed a threat inland, as it dumped tremendous amounts of rain on the Eastern Seaboard. The system finally dissipated in the open Atlantic on September 19. Florence posed a major threat to the East Coast of the United States, especially North Carolina and South Carolina, which declared states of emergency, along with Virginia, Maryland, and Washington, D.C. The NHC issued its first hurricane watches at 9:00 UTC on September 11. A tropical wave departed the west coast of Africa on August 26 and moved quickly across the tropical Atlantic with little convective activity. On August 30, an increase in cloudiness and showers occurred as the wave approached the Caribbean Sea, at which time the NHC began monitoring it for tropical cyclone development. Gradual organization occurred as the system moved northwestward toward the Bahamas, and at 18:00 UTC on September 2, it was designated Potential Tropical Cyclone Seven, as it was forecasted to impact land areas as a tropical storm within two days. At 06:00 UTC the following day, a tropical depression developed from the disturbance, and just three hours later it strengthened into Tropical Storm Gordon. Moving west-northwestward to northwestward around a strong subtropical ridge, Gordon continued to quickly strengthen, reaching an initial peak intensity with sustained winds of 50 mph (85 km/h) as it made landfall near Tavernier, Florida at 11:15 UTC. After making a second landfall near Flamingo at 13:15 UTC, Gordon emerged into the Gulf of Mexico. An eye-like feature briefly appeared late on September 3 as the small tropical cyclone continued to strengthen. At 18:00 UTC on September 4, Gordon reached its peak intensity with maximum sustained winds of 70 mph (110 km/h), making landfall at that intensity at 03:15 UTC the following day near the Alabama-Mississippi border. The tropical storm quickly weakened to a tropical depression at 12:00 UTC, degenerating into a remnant low at 18:00 UTC on September 6 near Pine Bluff, Arkansas. The remnant low degenerated into a trough early on September 8 before merging with a developing extratropical low later that day. On September 7, the NHC began monitoring an area of disturbance near Senegal, developing from a tropical wave emerging from the coast of West Africa. The system had been forecast to develop a tropical depression in the previous days. The system rapidly organized near the west coast of Africa and was designated as Potential Tropical Cyclone Eight, at 12:00 UTC on September 7, just off the coast of Africa, as it was threatening to impact the Cape Verde Islands. The system continued to organize, and on the same day, it became Tropical Depression Eight. The system later strengthened into Tropical Storm Helene on the same day. On September 9, Helene strengthened into a Category 1 hurricane, with winds of 85 mph (140 km/h) at 13°54′N 27°12′W﻿ / ﻿13.9°N 27.2°W﻿ / 13.9; -27.2﻿ (Helene), trailing 2015's Hurricane Fred as the easternmost hurricane to form in the main development region (MDR) during the satellite era. Helene strengthened into a Category 2 hurricane at 15:00 UTC on September 10, but quickly weakened into a tropical storm at 15:00 UTC on September 13. Tropical storm watches were issued for the Azores at 21:00 UTC on September 13, which were upgraded to tropical storm warnings at 09:00 UTC on September 14. From September 13–14, Helene interacted with the smaller Tropical Storm Joyce to the west, due to the Fujiwhara effect, steering Joyce counter-clockwise around the larger system. Afterward, Helene began accelerating toward the northeast, passing over the Azores late on September 15. On September 16, Helene transitioned into an extratropical cyclone while accelerating toward the British Isles, becoming the first named storm of the 2018–19 European windstorm season. On September 18, Helene moved across the northern periphery of Ireland, before drifting into the Norwegian Sea. On September 22, Helene's remnant was absorbed into another extratropical storm approaching from the southwest. Heavy rainfall from the precursor tropical wave in Guinea triggered flooding, which claimed three lives in Doko on September 6. As a tropical cyclone, Helene passed close to Flores Island in the Azores with winds of up to 62 mph (100 km/h) on September 15. After completing an extratropical transition, Ex-Hurricane Helene continued onwards to impact Ireland and the United Kingdom. Weather warnings forecasting winds of up to 65 mph (105 km/h) were issued for southern and western areas of the United Kingdom; however, Helene weakened considerably as it approached the British Isles, and all weather warnings were discontinued on September 18, as Helene was crossing northern England with only minimal impacts. On September 2, the NHC began monitoring a tropical wave situated over West Africa. On September 7, the tropical wave was forecast to have a 90% chance of developing into a tropical cyclone within the next few days. Later on the same day, the storm developed into Tropical Depression Nine simultaneously with Tropical Depression Eight, which would go on to become Tropical Storm Helene. 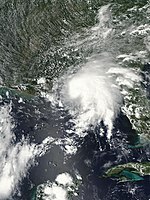 On September 8, the system intensified into Tropical Storm Isaac. Early on September 10, Isaac strengthened into a Category 1 hurricane, following Helene, and was noted to be quite small. The system weakened into a tropical storm at 03:00 UTC on September 11. At 09:00 UTC on September 14, the system weakened into a tropical depression. However, at 21:00 UTC on the same day, Isaac briefly restrengthened into a tropical storm, although it soon weakened once more, degenerating into an elongated trough at 10:00 UTC on September 15. The NHC began monitoring a non-tropical area of low pressure forming along a trough of low pressure on September 11. Contrary to forecasts of gradual organization, the low quickly acquired subtropical characteristics as it moved southwestward. At 21:00 UTC on September 12, the low strengthened into Subtropical Storm Joyce. From September 13–14, Joyce interacted with the larger Hurricane Helene, due to the Fujiwhara effect, with Joyce being steered counter-clockwise around Helene. At 03:00 UTC on September 14, Joyce transitioned into a tropical storm. Later that day, Joyce began turning eastward. Late on September 14, Joyce reached its peak intensity, with a more organized appearance on satellite. Afterward, Joyce began to weaken, due to the increasing wind shear. At 15:00 UTC on September 16, Joyce weakened into a tropical depression. At 00:00 UTC on September 19, Joyce weakened into a remnant low, and the NHC issued their last advisory on the system. A tropical wave moved off the west coast of Africa on September 14, with signs of rotation. As the wave traversed the Tropical Atlantic, rotation slightly weakened. After a few days moving westward, convection and organization gradually improved. On September 18, a large area of disturbed weather in association with a tropical wave developed far to the east-southeast of the Lesser Antilles. The system initially lacked a surface circulation, and though a weak one formed on September 20, strong upper-level winds and dry air were expected to limit further development. Deep convection, despite being displaced east of the center, became persistent throughout the day, leading to the formation of a tropical depression by 18:00 UTC on September 21. However, the depression failed to strengthen further within an increasingly hostile environment, eventually degenerating into an elongated trough on the following day. A tropical wave moved off the west coast of Africa near Sierra Leone early on September 21. Contrary to forecasts of slow organization, the wave quickly organized amidst a favorable environment as it moved swiftly westward across the far eastern Atlantic. By 15:00 UTC on September 22, the wave had organized sufficiently to be classified as Tropical Storm Kirk. 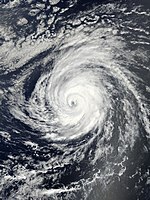 Kirk became a named storm at 8.3°N, marking the lowest latitude for a system of tropical storm strength or higher in the north Atlantic since an unnamed hurricane in 1902. For comparison, the lowest-latitude formation for a tropical cyclone of tropical depression strength in the north Atlantic basin was Hurricane Isidore in 1990, which formed at just 7.2°N. Little change in strength occurred as Kirk accelerated across the tropical Atlantic, possibly owing to its high forward speed, and it weakened to a tropical depression early on September 24, before degenerating into an open trough at 15:00 UTC later that day. The remnant trough continued westward and quickly reorganized, and at 09:00 UTC on September 26, the remnants of Kirk reacquired a well-defined circulation and became a tropical storm once again. Tropical storm watches and warnings were issued at 09:00 UTC on September 26. The newly-reformed storm started intensifying, and at 18:00 UTC on the same day, Kirk reached its peak intensity with sustained winds of 60 mph (95 km/h). Strong wind shear would cause the storm to weaken slightly over the next day as it continued its approach toward the Lesser Antilles, and around 00:30 UTC on September 28, the storm made landfall on St. Lucia. Weakening continued as Kirk continued westward through the Caribbean Sea, and the surface circulation became exposed to the west of the main convection. Early on September 29, Kirk degenerated into an open tropical wave over the eastern Caribbean Sea. In the midst of an active September, the NHC began monitoring an area southwest of the Azores for tropical or subtropical development within the next several days on September 19. A non-tropical area of low pressure formed on September 22, quickly transitioning into a subtropical storm by 15:00 UTC on the next day, with the NHC assigning the storm the name Leslie. After little change in strength had occurred in two days, Leslie began to weaken, first into a subtropical depression early on September 25, before becoming post-tropical later that day as the system began to merge with an approaching frontal system. Leslie subsequently merged with the frontal system and began a cyclonic loop to the west, intensifying during this time, and becoming a powerful extratropical cyclone with hurricane-force winds early on September 27. After reaching its extratropical peak, Post-Tropical Cyclone Leslie gradually weakened, as the storm began to lose its frontal structure. However, Leslie simultaneously began to reacquire subtropical characteristics, and by 21:00 UTC on September 28, Leslie became a subtropical storm once again. A day after regenerating, Leslie became fully tropical. Over the next several days, Leslie slowly drifted to the south-southwest, while gradually intensifying. 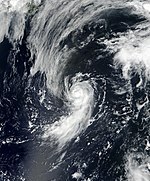 At 09:00 UTC on October 3, Leslie strengthened into a Category 1 hurricane, the sixth hurricane of the season. However, Leslie weakened back into a tropical storm late on the next day, with satellite data indicating that Leslie may have been trying to undergo an eyewall replacement cycle, albeit with a very large eye. For the next few days, Leslie slowly continued to drift northeastward, without much change in intensity. On October 7, Leslie began turning to the east-southeast. After a period of weakening, Leslie started restrengthening late on October 8. Early on October 10, Leslie intensified into a Category 1 hurricane for the second time and executed a sharp turn to the east-northeast. 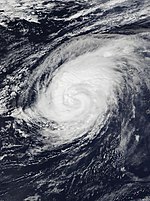 At 18:00 UTC on October 13, Leslie transitioned into a powerful extratropical cyclone 120 miles west-northwest of Lisbon, before making landfall soon afterward. On October 11, a tropical storm warning was issued for Madeira for the first time in the island's history, and Leslie became the first tropical cyclone to pass within 100 miles (160 km) of the archipelago since reliable record-keeping began in 1851. Prior to Leslie, Hurricane Vince in 2005 passed closer to the islands than any other tropical cyclone. Madeira officials closed beaches and parks. The threat of the storm caused eight airlines to cancel flights into Madeira. More than 180 sports matches on the island were canceled, more than half of them affecting the Madeira Football Association. Early on October 2, the NHC began monitoring a broad area of low pressure that had developed over the southwestern Caribbean Sea. While strong upper-level winds initially inhibited development, the disturbance gradually became better organized as it drifted generally northward and then eastward toward the Yucatán Peninsula. On October 6, the system became sufficiently organized to be declared a potential tropical cyclone, and the NHC initiated advisories on Potential Tropical Cyclone Fourteen. Early on the next morning, the system organized into a tropical depression, before intensifying into Tropical Storm Michael several hours later. Michael quickly became a hurricane around midday on October 8 as a result of rapid intensification. At 21:00 UTC on October 9, while approaching the Gulf Coast, Michael strengthened into a major hurricane with winds reaching 120 mph, making it the second major hurricane of the season. Despite the NHC forecasting the hurricane to make landfall with winds of 125 mph, data from Hurricane Hunters indicated that Michael continued to rapidly intensify, becoming a Category 4 at 6:00 UTC on October 10 with winds of 130 mph. 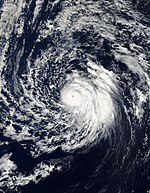 At 18:00 UTC on October 10, Michael made landfall with sustained winds of 155 miles per hour (250 km/h) and a minimum central pressure of 919 millibars (27.1 inHg), becoming the strongest storm of the season and also the third-strongest landfalling hurricane in the U.S. on record, in terms of central pressure. After crossing through the southeastern United States, Michael started restrengthening early on October 12 as a result of baroclinic forcing; however, the system transitioned into an extratropical cyclone soon afterward. The combined effects of the precursor low to Michael and a disturbance over the Pacific Ocean caused significant flooding across Central America. Nearly 2,000 homes in Nicaragua suffered damage and 1,115 people evacuated. A total of 253 and 180 homes were damaged in El Salvador and Honduras, respectively. More than 22,700 people were directly affected throughout the three countries. Catastrophic damage occurred in Mexico Beach, Florida, where the storm made landfall at peak intensity. Michael killed at least 60 people; at least 15 fatalities occurred across Central America: 8 in Honduras, 4 in Nicaragua, and 3 in El Salvador. In the United States, at least 57 were killed across Florida, Georgia, North Carolina, and Virginia, mostly in the state of Florida. Michael caused at least $25 billion (2018 USD) in property damage in the U.S., along with an additional $100 million (2018 USD) in damages in Central America. Early on October 6, a tropical wave moved off the west coast of Africa. The wave soon fractured as it moved into the tropical Atlantic, with the northern portion moving over cool waters and the southern portion continuing westward over warm waters. Convection associated with the southern portion increased and became more organized, and a well-defined circulation developed on October 7, at which time the NHC began monitoring it for tropical cyclone development. The disturbance continued to organize over the next day as a well-defined surface low developed. At 06:00 UTC on October 9, while located southwest of Cape Verde, the disturbance organized into a tropical depression, and six hours later strengthened into Tropical Storm Nadine.. 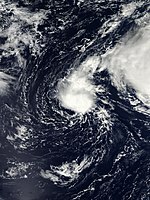 Upon its designation as a tropical storm at the longitude of 30°W, Nadine became the easternmost named storm to develop in the tropical Atlantic so late in the calendar year. Located within a very favorable environment with low wind shear, warm sea surface temperatures, and abundant atmospheric moisture, the small tropical cyclone quickly intensified, reaching its peak intensity with maximum sustained winds of 65 mph (100 km/h) around 06:00 UTC on October 10. At that time, a well-defined eye feature was evident in microwave imagery. However, an abrupt increase in westerly wind shear brought an end to the strengthening trend, and Nadine began to weaken later that day. Turning sharply west-northwestward, Nadine encountered hostile environmental conditions which resulted in the cyclone weakening to a tropical depression at 18:00 UTC on October 12. The weakening cyclone degenerated into an open wave six hours later. The wave continued to move westward for the next several days, finally dissipating just east of the Lesser Antilles early on 16 October. The following list of names was used for named storms that formed in the North Atlantic in 2018. The names not retired from this list will be used again in the 2024 season. This was the same list used in the 2012 season, with the exception of the name Sara, which replaced Sandy. No names were used for the first time in 2018. On March 20, 2019, at the 41st session of the RA IV hurricane committee, the World Meteorological Organization retired the names Florence and Michael from its rotating naming lists due to the number of deaths and amount of damage they caused, and they will not be used again for another Atlantic hurricane. They will be replaced with Francine and Milton, respectively, for the 2024 season. ^ a b KCBD (August 9, 2018). "NOAA revises hurricane predictions, says Atlantic will have below average season". Archived from the original on 2018-08-10. Retrieved 2018-08-09. ^ "A rare hurricane-free August? That's what it's looking like". The News-Press. ^ a b c d e f g Blake, Eric S. (December 14, 2018). Tropical Cyclone Report: Hurricane Chris (PDF) (Report). National Hurricane Center. Retrieved December 21, 2018. ^ Stacy R. Stewart (July 10, 2018). "Hurricane Chris Discussion Number 17". National Hurricane Center. Retrieved July 10, 2018. ^ Robbie J. Berg (July 11, 2018). "Hurricane Chris Discussion Number 22". National Hurricane Center. Retrieved December 21, 2018. ^ Cunningham, Kacey (July 10, 2018). "Beachfront homes take pounding from Hurricane Chris". WRAL-TV. Retrieved December 21, 2018. ^ a b c d Richard J. Pasch (March 28, 2019). Tropical Cyclone Report: Tropical Storm Debby (PDF) (Report). Miami, Florida: National Hurricane Center. Retrieved April 5, 2019. ^ Sam Lillo [@splillo] (5 September 2018). "Intensity at 18z has been increased to 115kt -- Florence is officially a category 4 hurricane. At 22.4N / 46.2W, this also makes Florence the furthest north category 4 hurricane east of 50W ever recorded in the Atlantic" (Tweet). Retrieved 5 September 2018 – via Twitter. ^ "Hurricane Florence Discussion Number 41". www.nhc.noaa.gov. Retrieved 2018-09-08. ^ "Hurricane Florence Public Advisory Number 45". www.nhc.noaa.gov. Retrieved 2018-09-10. ^ "Hurricane FLORENCE". www.nhc.noaa.gov. Retrieved 2018-09-10. ^ "Hurricane FLORENCE". www.nhc.noaa.gov. Retrieved 2018-09-13. ^ "Tropical Depression FLORENCE". www.nhc.noaa.gov. Retrieved 2018-09-17. ^ "Post-Tropical Cyclone FLORENCE". www.nhc.noaa.gov. Retrieved 2018-09-19. ^ Croft, Jay; Jason, Hanna (9 September 2018). "Florence upgraded to hurricane, could threaten East Coast this week". CNN. Retrieved 9 September 2018. ^ "Hurricane FLORENCE". www.nhc.noaa.gov. Retrieved 2018-09-11. ^ a b c d e f Daniel P. Brown; Andrew S. Latto; Robbie J. Berg (February 19, 2019). Tropical Cyclone Report: Tropical Storm Gordon (PDF) (Report). Miami, Florida: National Hurricane Center. Retrieved February 21, 2019. ^ "Hurricane Helene Advisory Number 11". www.nhc.noaa.gov. Retrieved 2018-09-09. ^ Philip Klotzbach [@philklotzbach] (9 September 2018). "Helene now has max winds of 85 mph at 27.2°W. In the satellite era (since 1966), the only Atlantic hurricane further east to be this strong in the tropics (south of 23.5°N) is Fred (2015)" (Tweet). Retrieved 10 September 2018 – via Twitter. ^ Michael Brennan (September 10, 2018). "Hurricane Helen Tropical Cyclone Update". National Hurricane Center. Retrieved September 11, 2018. ^ a b Daniel Brown (September 14, 2018). "Tropical Storm Joyce Discussion Number 7". Miami, Florida: National Hurricane Center. Retrieved September 18, 2018. ^ John L. Beven (September 15, 2018). "Tropical Storm Helene Discussion Number 34". National Hurricane Center. Retrieved September 18, 2018. ^ "Met Éireann briefing on Ex Tropical Storm Helene 4pm Monday 17th September – Met Éireann – The Irish Meteorological Service". www.met.ie. Met Éireann. 17 September 2018. Retrieved 17 September 2018. ^ "Europe Weather Analysis on 2018-9-18". Free University of Berlin. September 18, 2018. Retrieved September 24, 2018. ^ "Europe Weather Analysis on 2018-9-21". Free University of Berlin. September 21, 2018. Retrieved September 24, 2018. ^ "Europe Weather Analysis on 2018-9-22". Free University of Berlin. September 22, 2018. Retrieved September 24, 2018. ^ Eric Blake (September 2, 2018). "Atlantic 2-Day Graphical Tropical Weather Outlook - 200 PM EDT Sat Sept 8 2018". National Hurricane Center. Retrieved September 8, 2018. ^ "Tropical Depression Nine Discussion Number 1". www.nhc.noaa.gov. Retrieved 2018-09-07. ^ "Tropical Storm Isaac Discussion Number 5". www.nhc.noaa.gov. Retrieved 2018-09-08. ^ "Hurricane Isaac Forecast Discussion Number 10". www.nhc.noaa.gov. Retrieved 2018-09-08. ^ Daniel Brown (September 14, 2018). "Tropical Depression Isaac Discussion Number 27". National Hurricane Center. Retrieved September 14, 2018. ^ Eric Blake (September 14, 2018). "Tropical Storm Isaac Discussion Number 29". National Hurricane Center. Retrieved September 14, 2018. ^ John P. Cangialosi (September 11, 2018). "NHC Graphical Tropical Weather Outlook Archive". Miami, Florida: National Hurricane Center. Retrieved September 13, 2018. ^ Lixion Avila (September 12, 2018). "Subtropical Storm Joyce Discussion Number 1". Miami, Florida: National Hurricane Center. Retrieved September 13, 2018. ^ David Zelinsky (September 14, 2018). "Tropical Storm Joyce Discussion Number 6". National Hurricane Center. Retrieved September 14, 2018. ^ John L. Beven (September 14, 2018). "Tropical Storm Joyce Wind Speed Probabilities Number 9". National Hurricane Center. Retrieved September 14, 2018. ^ David Zelinskly (September 14, 2018). "Tropical Storm Joyce Discussion Number 10". National Hurricane Center. Retrieved September 18, 2018. ^ John Cangialosi (September 16, 2018). "Tropical Depression Joyce Discussion Number 16". National Hurricane Center. Retrieved September 16, 2018. ^ "Post-Tropical Cyclone JOYCE". www.nhc.noaa.gov. Retrieved 2018-09-19. ^ Avila, Lixion (November 9, 2018). "Tropical Cyclone Report, Tropical Depression Eleven" (PDF). ^ Stacy R. Stewart (September 18, 2018). "Graphical Tropical Weather Outlook". Miami, Florida: National Hurricane Center. Retrieved September 22, 2018. ^ Amy Campbell; Eric S. Blake (September 21, 2018). "Graphical Tropical Weather Outlook". College Park, Maryland: Weather Prediction Center. Retrieved September 22, 2018. ^ Lixion A. Avila (November 9, 2018). Tropical Cyclone Report: Tropical Depression Eleven (PDF) (Report). Miami, Florida: National Hurricane Center. p. 4. Retrieved February 14, 2019. ^ Lixion A. Avila (September 23, 2018). Remnants Of Eleven Discussion Number 7 (Report). Miami, Florida: National Hurricane Center. Retrieved September 23, 2018. ^ Stacy R. Stewart (September 21, 2018). "NHC Graphical Tropical Weather Outlook Archive". Miami, Florida: National Hurricane Center. Retrieved September 22, 2018. ^ Michael J. Brennan (September 22, 2018). "Tropical Storm Kirk Discussion Number 1". Miami, Florida: National Hurricane Center. ^ Klotzbach, Philip. "Kirk has formed in the eastern tropical Atlantic at 8.3°N". Twitter. Retrieved 22 September 2018. ^ Bahm, Daulton. "Tropical Storm Bret becomes earliest named storm in Atlantic MDR, Potential Tropical Cyclone Three a threat to Gulf Coast". Cyclonic Fury. Retrieved 22 September 2018. ^ David Zelinsky (September 23, 2018). "Tropical Depression Kirk Discussion Number 7". Miami, Florida: National Hurricane Center. Retrieved September 23, 2018. ^ Richard Pasch (September 24, 2018). "Remnants Of Kirk Discussion Number 9". Miami, Florida: National Hurricane Center. Retrieved September 24, 2018. ^ Stacy R. Stewart (September 26, 2018). "Tropical Storm Kirk Discussion Number 10". Miami, Florida: National Hurricane Center. ^ "Tropical Storm KIRK". www.nhc.noaa.gov. Retrieved 2018-09-26. ^ "Tropical Storm Kirk Forecast Discussion". www.nhc.noaa.gov. Retrieved 2018-09-28. ^ "Tropical Storm Kirk Discussion Number 19". www.nhc.noaa.gov. Retrieved 2018-09-28. ^ Robbie Berg (September 29, 2018). "Remnants Of Kirk Discussion Number 20". Miami, Florida: National Hurricane Center. Retrieved September 29, 2018. ^ Lixion A. Avila (September 19, 2018). "Graphical Tropical Weather Outlook". Miami, Florida: National Hurricane Center. Retrieved September 23, 2018. ^ Robbie J. Berg (September 22, 2018). "Graphical Tropical Weather Outlook". Miami, Florida: National Hurricane Center. Retrieved September 23, 2018. ^ Lixion A. Avila (September 23, 2018). Subtropical Storm Leslie Public Advisory Number 1 (Report). Miami, Florida: National Hurricane Center. Retrieved September 23, 2018. ^ John Cangialosi (September 25, 2018). "Subtropical Depression Leslie Public Advisory Number 8". Miami, Florida: National Hurricane Center. Retrieved September 25, 2018. ^ Dave Roberts (September 25, 2018). "Post-Tropical Cyclone Leslie Discussion Number 9". Miami, Florida: National Hurricane Center. Retrieved September 25, 2018. ^ John Cangialosi (September 27, 2018). "Two-Day Graphical Tropical Weather Outlook - 2:00 AM EDT Thu Sept 27 2018". Miami, Florida: National Hurricane Center. Retrieved September 27, 2018. ^ Jack Beven (September 28, 2018). "Subtropical Storm Leslie Advisory Number 10". Miami, Florida: National Hurricane Center. Retrieved September 28, 2018. ^ Zelinsky, David. "Tropical Storm Leslie Forecast Discussion". www.nhc.noaa.gov. National Hurricane Center. Retrieved 29 September 2018. ^ Daniel Brown (October 3, 2018). "Hurricane Leslie Discussion Number 28". Miami, Florida: National Hurricane Center. Retrieved October 3, 2018. ^ John L. Beven (October 4, 2018). "Tropical Storm Leslie Discussion Number 34". Miami, Florida: National Hurricane Center. Retrieved October 7, 2018. ^ David Zelinsky (October 7, 2018). "Tropical Storm Leslie Discussion Number 45". Miami, Florida: National Hurricane Center. Retrieved October 7, 2018. ^ "Tropical Storm LESLIE". www.nhc.noaa.gov. Retrieved 2018-10-09. ^ "Hurricane LESLIE". www.nhc.noaa.gov. Retrieved 2018-10-10. ^ "Post-Tropical Cyclone LESLIE". www.nhc.noaa.gov. Retrieved 2018-10-25. ^ Blake, Eric. "Hurricane Leslie Discussion Number 63". National Hurricane Center. Retrieved 12 October 2018. ^ Stacy R. Stewart (October 2, 2018). "NHC Graphical Tropical Weather Outlook Archive". Miami, Florida: National Hurricane Center. Retrieved October 7, 2018. ^ Jack Beven (October 6, 2018). "Potential Tropical Cyclone Fourteen Advisory Number 1". Miami, Florida: National Hurricane Center. Retrieved October 7, 2018. ^ John L. Beven (October 6, 2018). "Potential Tropical Cyclone Fourteen Discussion Number 1". Miami, Florida: National Hurricane Center. Retrieved October 6, 2018. ^ Robbie Berg (October 7, 2018). "Tropical Depression Fourteen Discussion Number 3". Miami, Florida: National Hurricane Center. Retrieved October 7, 2018. ^ Daniel P. Brown (October 7, 2018). "Tropical Storm Michael Tropical Cyclone Update". Miami, Florida: National Hurricane Center. Retrieved October 7, 2018. ^ a b "Hurricane MICHAEL". www.nhc.noaa.gov. Retrieved 2018-10-08. ^ Beven, Jack. "Hurricane MICHAEL". www.nhc.noaa.gov. National Hurricane Center. Retrieved 11 October 2018. ^ Daniel P. Brown (October 10, 2018). "Hurricane Michael Discussion 17". Miami, Florida: National Hurricane Center. Retrieved October 11, 2018. ^ "Post-Tropical Cyclone MICHAEL". www.nhc.noaa.gov. Retrieved 2018-10-12. ^ a b "Al menos 9 muertos y miles de afectados por un temporal en Centroamérica" (in Spanish). October 7, 2018. Retrieved October 7, 2018. ^ Wright, Pam (October 13, 2018). "Michael Death Toll Climbs to 18; Search Continues for Missing". The Weather Channel. Retrieved October 14, 2018. ^ "Sube a ocho el número de muertos por las lluvias en Honduras". El Nuevo Diario (in Spanish). October 10, 2018. Retrieved October 12, 2018. ^ a b "Hurricane Michael Death Toll Now at 35 in Florida, 45 Total". Insurance Journal. October 30, 2018. Retrieved February 2, 2019. ^ Breslin, Sean (October 17, 2018). "Hurricane Michael Death Toll Rises to 35 as Mexico Beach Residents Return to Survey Damage". The Weather Channel. Retrieved October 19, 2018. ^ a b c "Assessing the U.S. Climate in 2018 Warm temperatures and significant precipitation round out 2018". NOAA. National Center for Environmental Information. February 6, 2019. Retrieved February 9, 2019. ^ a b c d e f Stacy R. Stewart (March 22, 2019). Tropical Cyclone Report: Tropical Storm Nadine (PDF) (Report). Miami, Florida: National Hurricane Center. Retrieved April 6, 2019. ^ Lixion Avila (October 7, 2018). "NHC Graphical Tropical Weather Outlook Archive". Miami, Florida: National Hurricane Center. Retrieved October 9, 2018. ^ Klotzbach, Philip. "#Nadine has formed in the eastern tropical Atlantic". Twitter. Retrieved October 10, 2018. ^ Robbie J. Berg (October 23, 2018). "Graphical Tropical Weather Outlook". Miami, Florida: National Hurricane Center. Retrieved October 26, 2018. ^ Eric S. Blake (October 23, 2018). "Graphical Tropical Weather Outlook". Miami, Florida: National Hurricane Center. Retrieved October 26, 2018. ^ John P. Cangialosi (October 26, 2018). "Graphical Tropical Weather Outlook". Miami, Florida: National Hurricane Center. Retrieved October 26, 2018. ^ Daniel P. Brown (February 19, 2019). Tropical Cyclone Report: Hurricane Oscar (PDF) (Report). Miami, Florida: National Hurricane Center. p. 6. Retrieved February 21, 2019. ^ John L. Beven II (October 28, 2018). Tropical Storm Oscar Discussion Number 5 (Report). Miami, Florida: National Hurricane Center. Retrieved October 28, 2018. ^ Stacy R. Stewart (October 28, 2018). Hurricane Oscar Discussion Number 8 (Report). Miami, Florida: National Hurricane Center. Retrieved October 28, 2018. ^ Daniel P. Brown (October 30, 2018). Hurricane Oscar Advisory Number 13 (Report). Miami, Florida: National Hurricane Center. Retrieved October 31, 2018. ^ Robbie J. Berg (October 31, 2018). Hurricane Oscar Advisory Number 19 (Report). Miami, Florida: National Hurricane Center. Retrieved October 31, 2018. ^ John L. Beven (October 31, 2018). Post-Tropical Cyclone Oscar Discussion Number 20 (Report). Miami, Florida: National Hurricane Center. Retrieved October 31, 2018. ^ Florence and Michael retired by the World Meteorological Organization (Report). National Oceanic and Atmospheric Administration. March 20, 2019. Retrieved March 20, 2019. ^ Robbie Berg (October 17, 2018). Tropical Storm Alberto Tropical Cyclone Report (PDF) (Report). National Hurricane Center. Retrieved October 21, 2018. ^ "Cooper puts Hurricane Florence damage at $13 billion". WITN. Associated Press. October 10, 2018. Retrieved October 14, 2018. ^ "Global Catstrophe Recap - September 2018" (PDF). Aon Benfield. October 9, 2018. p. 4. Retrieved October 10, 2018. ^ RA IV Hurricane Committee Members (February 12, 2019). Country Report: Saint Lucia (pdf) (Report). Retrieved April 1, 2019. ^ British Caribbean Territories (February 14, 2019). Country Report: British Caribbean Territories (pdf) (Report). Retrieved April 1, 2019. Wikimedia Commons has media related to 2018 Atlantic hurricane season. This page was last edited on 9 April 2019, at 14:29 (UTC).